One aspect of game design that doesn’t get talked about a lot is organization. It’s possible that this has heightened importance since I live in a space-starved home in Vancouver, but I think all designers need to have a certain amount of organization. When you first start out making games, you purchase (or find!) the components you need for that game. But as you start to accumulate bits and pieces, you quickly realize that you need some sort of place to keep your components. Often designers start out by using tool boxes or craft storage boxes as they both have many compartments to help you keep your differently shaped pieces separate. This makes it quite a bit easier when you need specific pieces – you can just go to that compartment and get what you need. These boxes also have another benefit – portability. If you find that you’re often going to other places to design games, then portability is going to be important to you. I only design at my home, and I’ve found that since we’re designing more and more games, my need to keep my components accessible has increased. So let’s take a look at the various ways I keep my stuff in order! We’ll start with card sleeves. This is probable the most used component in all of game design for me. Often after a playtest that didn’t work, we have to totally change an entire card set – and instead of de-sleeving and re-sleeving, I have found that I have just made a new deck with new sleeves. This means that I get a pile-up of old prototypes that no longer work but are still consuming my sleeves. So every once in awhile I spend an hour or so de-sleeving all my old prototypes. Here are all the garbage old prototype cards that no longer need sleeves! 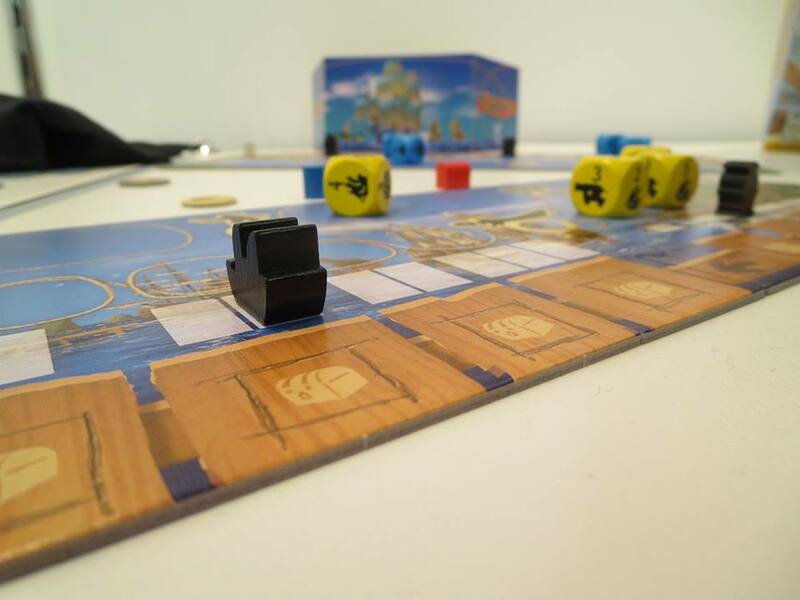 You can see our prototype of Akrotiri and Orphan Black in here! So then where do I put the sleeves? Well, I use a regular cardboard card organizer that one would use for Magic cards. I sort everything by colour which makes it easy to get what I want. One thing I do wish – I wish I only ever bought one brand of card sleeves. You can see that in some colours that there are many different groups. That’s because even though they’re all BLACK – they’re all a different BLACK! So I couldn’t use them in the same deck. Next up is all my bits! I’m pretty lucky because I found this amazing piece of furniture at a store that was closing down. It’s looks beautiful and it’s amazingly functional for my needs. Each drawer holds some amazing goodies for a game designer. Let’s take a look at each row of drawers. The top left drawer is for coloured wooden discs and coloured wooden cubes. My supply of wooden cubes is ridiculously low. I’ll have to go get some more! They are very useful when you need to make your own dice for a prototype! The top right drawer is for bags (like dice or chit bags) and trays. The next row I have a small drawer just for sand timers and then a large but thin drawer for dice! The next row I have an empty drawer on the left due to my clean-out yesterday (so I’ve put what I always use as money in games…actual money!). The middle drawer is all my sharpies and other markers. The right drawer is all my cutting and glueing supplies. The left drawer is all plastic pieces like pawns, standees, gems and other plastic doodads. The middle drawer is wood! Large coloured wooden cubes, small cubes, square wooden tokens, circle wooden tokens. And the right drawer is colour sorted wooden bits. In here there are 6 separate containers – one for each colour – full of similarly shaped wooden bits that I got from Fantasy Flight. Then I stuffed a bag of wooden cubes in there as well. Cubes! Probably my second most used prototyping tool I use – coloured plastic cubes. I find it imperative that these cubes be sorted based on colour. It makes prototyping so much easier. Often I’ll be leaving for a game night and forget that I need X number of a specific colour – and I can quickly grab what I need. I change the size of the compartments based on how many cubes of each colour that I have. The small leftmost drawer is just for elastics! The middle drawer is for tools I use – like the Crop-o-dile that makes rivets so you can make dials. The right drawer is my meeple drawer – again sorted by colour. This is the hardest drawer to keep clean. This is my baggie drawer. Right now it’s perfect! I put baggies of the same size in a another baggie of that size – so it’s easy to grab the size you want. But it gets super messy when I put baggies back as I’m not often as diligent in putting them back in the baggie they came from! There are still more drawers? Yep! The one on the left is a bit of a mishmash of things. Some wooden bits and some plastic. Couldn’t find a more thematic place to fit these bits. The drawer on the right are all coloured sticks. OK this is the last drawer – I promise! The one on the left is all flat, round tokens. The one on the right is another mishmash of things. So there you have it! That’s one way of keeping your bits organized. My drawers don’t always look this tidy as I just did a clean-out yesterday. It feels great to have all of these components at the ready. Makes prototyping a lot easier if I don’t have to leave my house to get a specific piece. The danger is that you start to buy components just because they’re cool and you think you’ll use them -for sure- in an upcoming game. There’s a fine balance to owning what you need and being prepared for the next game you’re going to make. I know I have a lot of things that I bought that I thought were cool – but I have never opened the package. I think I’ve settled down now though and am comfortable in how many components I have! The top 2 drawers are full of games that are ready to be play tested right now. I could grab any of these and take out to test. Once things have been tested, then the second drawer is the on-deck drawer if the prototype needs some tweaking before being tested again. Right now I haven’t been to a test night for awhile due to summer vacations and my teaching schedule so both the top two drawers are full of games ready for testing!! The third drawer is for games that are broken and need some more attention. We’re not too sure how to fix these ones – but they seemed close at one point! The next drawer is full of prototypes of games that have been signed or are being assessed by publishers right now. I keep them here until they come out because you never know if you will be asked to test another aspect of the game. The bottom two drawers are for games that we have currently abandoned. Some are super old but we have some games in here that are worth re-visiting from time to time. Often a game gets dumped in here if we can’t figure out how to make the game special and different. We have dug games out of these drawers and changed them up to make a totally new game later on! Never throw away a prototype! So how do you keep your bits and pieces organized? Let me know in the comments below! While at Origins, Nate from IDW Games was asked by Learn to Play to give an overview of how Godfather: A New Don works. He does an admirable job going through all the aspects of the game – but there are still some interesting things left to explore once it is released this summer! Remember to pre-order from your favourite local game store! 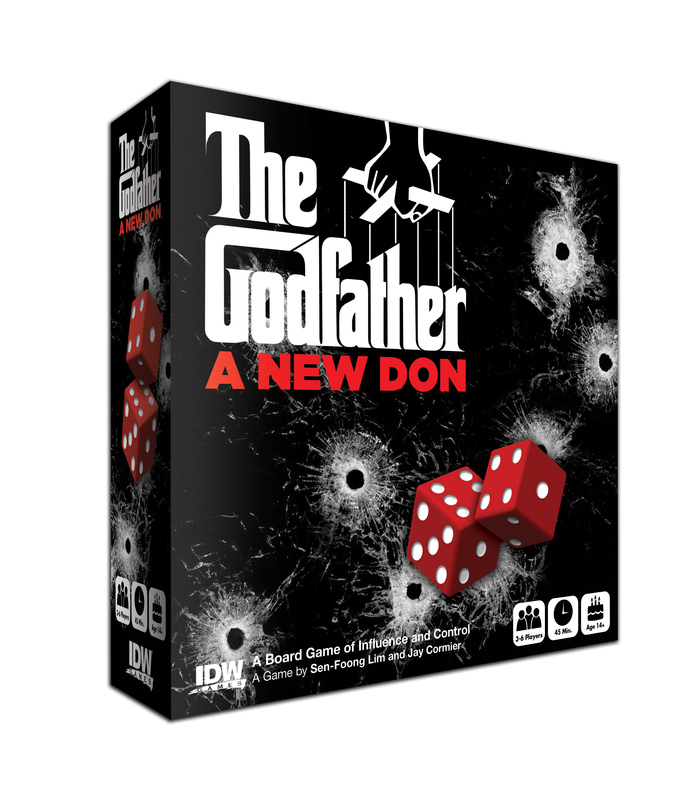 To help better explain our new Godfather: A New Don game (from IDW Games), we made a video! I have a starring role in the video and Sen created the cool Godfather-esque music for it! The video gives a quick rundown of how the game works so you have more information about whether this game is for you or not (trust me – it is for you!!). Ask your local your store to pre-order it for you can be the coolest person on the block! Here we go people! Our new game, Godfather: A New Don has a press release! With it we’re unveiling the box art – which is pretty spiffy. Even spiffier is the board art, done by map artist extraordinaire, Ron Guyatt! Check that out below the press release. IDW GAMES RELEASING BIG BOX GODFATHER BOARD GAME THIS SUMMER! San Diego, CA (March 16th, 2016) Control the streets of New York and bring power to your family in this summer’s The Godfather: A New Don. Designed by Jay Cormier and Sen-Foong Lim (Orphan Black, Belfort), The Godfather: A New Don is a game for 3-6 players that sees each player taking control of one of the major mafia families, each trying to assert their power in the streets of 1950’s New York in hopes of taking the reigns as the new kingpin of the criminal world. The game is playable in approximately 45 minutes. 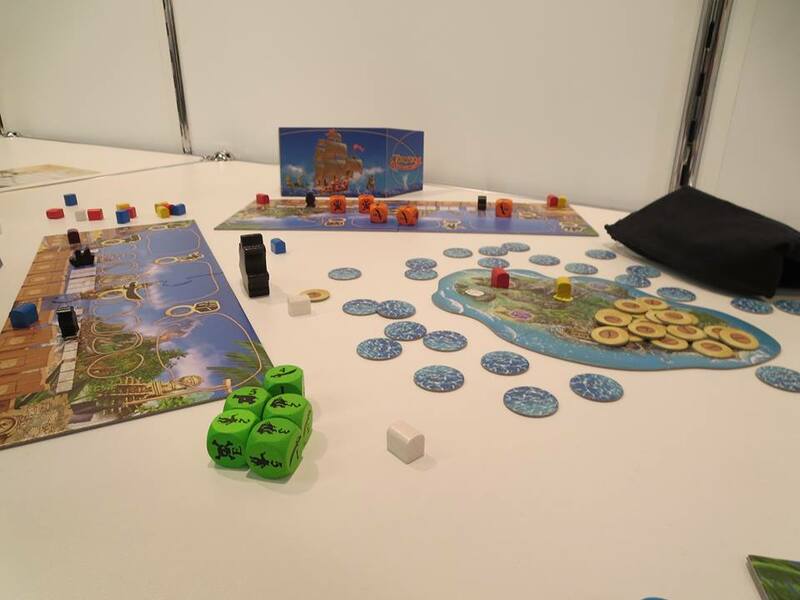 “I’m excited that we created an area control game that uses dice in a unique way! It’s accessible for inexperienced gamers but deep enough to please the serious gamers!” said Jay Cormier. “We’ve come up with a special blend of strategy and negotiation mixed with just the right amount of luck to capture the feeling of the crime families vying for control of New York. I really enjoyed tying the facets of the film into the game’s mechanisms,” added Sen-Foong Lim. The Godfather: A New Don is an area control board game with unique dice mechanics. Each round players will roll their individual pools of dice and decide what area of the city they’ll want to focus on trying to capture. Meanwhile, the current Don will be able to make players an offer they can’t refuse and steal dice from their limited supply. Staying on top proves difficult as every stolen die moves other players up the ladder toward taking over as Don, so the tension rises with each shake of the dice. With multiple ways to use each dice you roll, players will never find themselves at the mercy of the die, instead they’ll use what they roll to make their opponents beg for mercy. To learn more about the game and to sign up to be notified for updates about this and other titles visit http://idwgames.com “like” facebook.com/idwgames and follow @idwgames. Tortuga is hot! Also – new pledge levels announced! I was going to post that Tortuga was ranked 2nd in the hotness ranking on boardgamegeek yesterday (it’s a ranking based on how much traffic each game is getting on the site) – and then today I see that it’s climbed up to number 1! That’s great! It means a lot of people are interested and are checking out the game on BGG. Also, some new pledge levels have popped up! 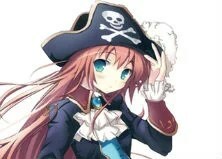 The Early Bird (get the game at $39) and the Sea Dog (get the game at $41) are all sold out – but they introduced a new level – Corsair (get the game at $43) – which is still $7 less than what you’d pay retail. Aaaaand, if you buy it retail – you won’t get all the stretch goal goodies!!! They also added their recent Kickstarter game, Fresco Big Box into some of the levels as well. So if you missed that very successful campaign, well now you can get it along with the bonus Kickstarter board! 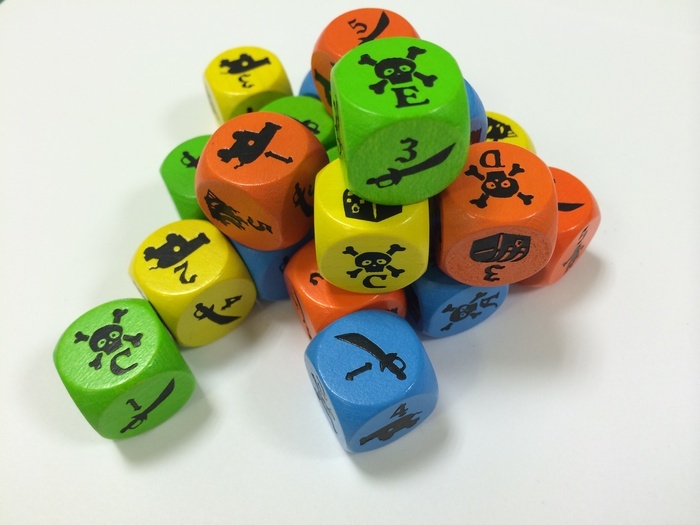 As a bonus – check out this photo that just came in of the dice used in the game. They look pretty sweet!! 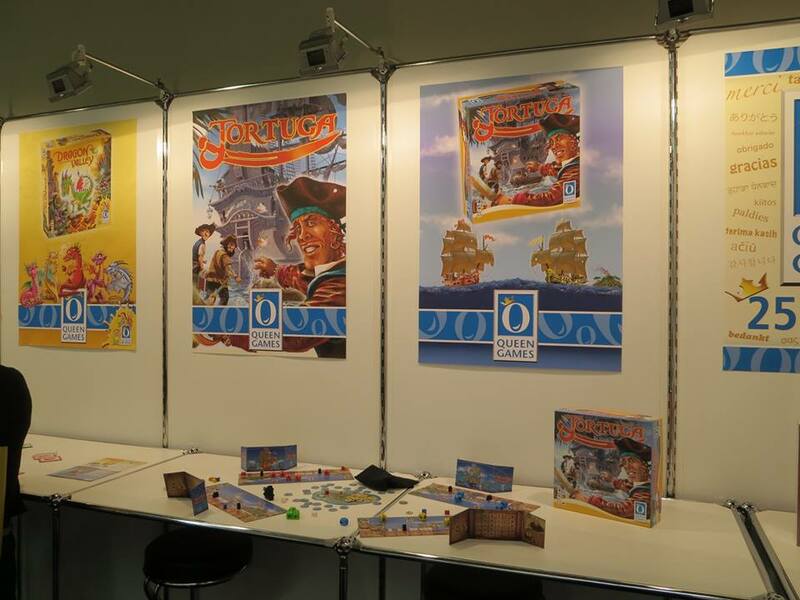 Pics of Tortuga at Nuremberg Toy Fair! While I wasn’t able to attend Nuremberg this year (heck, any year yet…I’d love to go one of these years! 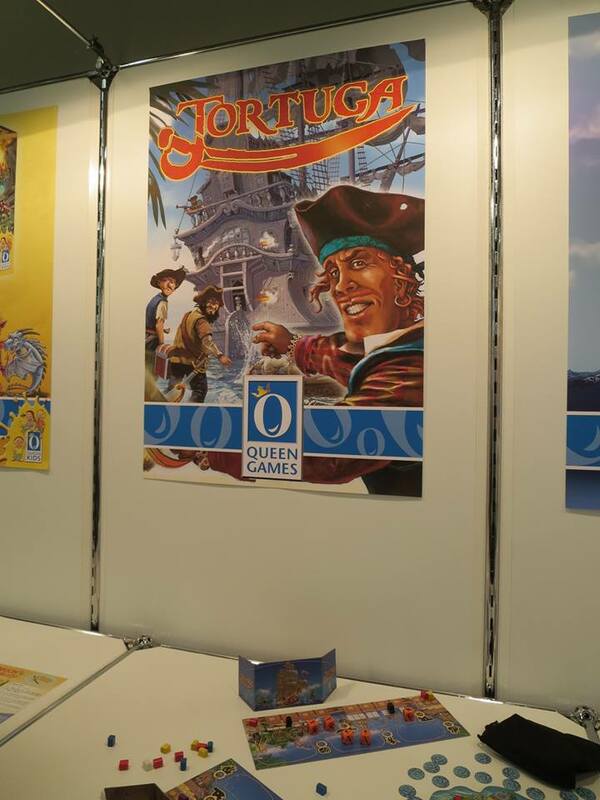 ), our friend Rose is currently there and she spotted Tortuga all set up on a table! Here are some pics of Tortuga that she took – but I have no guarantees that the final retail version will look identical to this. 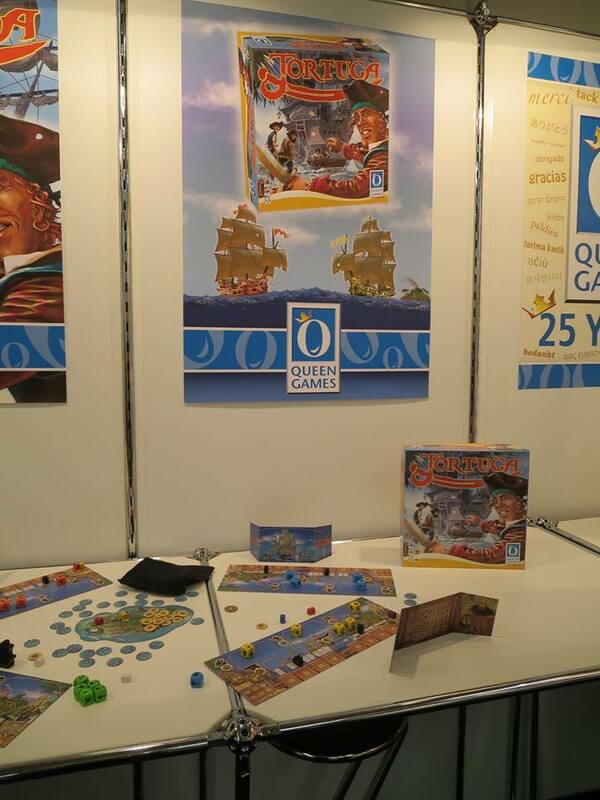 These pics could be a final prototype of the game from Queen – though they already do look very nice! Anywho – take a look! On the 17th Episode of The State of Games podcast, the folks at Dice Hate Me take a look at our latest release, Belfort. The good stuff (i.e. the stuff about Belfort!) starts at the 49 minute mark and features some very positive comments from the reviewers. Listen in! The first 3/4 of the podcast is also very interesting to listen to from the perspective of a game designer as it has to do with what girls like in board/card games. Definitely food for thought!